alaTest has collected and analyzed 315 reviews of Acer One 10 Series. The average rating for this product is 4.2/5, compared to an average rating of 4.3/5 for other products in the same category for all reviews. Reviewers are impressed by the touch screen and performance. The price and size are also appreciated. We analyzed user and expert ratings, product age and more factors. Compared to other products in the same category the Acer One 10 Series is awarded an overall alaScore™ of 90/100 = Excellent quality. 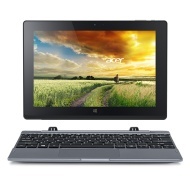 alaTest has collected and analyzed 121 user reviews of Acer One 10 Series from Amazon.co.uk. The average user rating for this product is 3.8/5, compared to an average user rating of 4.3/5 for other products in the same category on Amazon.co.uk. The new screen in the Aspire One also seems solid. However, higher contrast compared with the predecessor is offset by a lower color accuracy. Not much has changed in terms of performance - both devices are based on the outdated Bay Trail architecture. "Great Laptop . Lightweight and will be perfect for her ! " "I bought 2 laptops as christmas presents for my children. They are nice and small and compact." "Brought this as a Christmas for my 10 year old so haven't used yet to know exactly what it's like but looks suitable for what it will be needed for "
"Dont like the on/ off button.dosent always switch on.battery dosent seem to last very long.wouldnt buy this again"
"Loved the laptop great for my sons revision. Great delivery received it quicker than I expected and DPD were excellent. Good communication from AO"
"The lap top looks fantastic not sur how good it will Be as it's a Christmas present for my son . Service delivery all fantastic "
"Works well as both tablet an laptop, good for coursework or note taking in lectures I've found. Generally i would say it's a good buy."